Frequently Asked Questions | BellasBounciesIndoors.com Lake Villa IL. 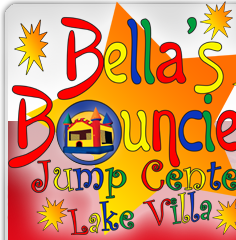 How do I schedule a party with Bella’s Bouncies? It's easy! You can click on the availability button on the left, or give us a call and we'd be happy to help you reserve your special day and time! A 50% non-refundable deposit is required to reserve your party. The balance is due and payable on the day of your party. • 15+ days prior to party - We will apply your deposit to your new date. • 6-14 days prior to your party – You will lose your deposit. A new deposit will be required to hold your new date. If we are able to rebook your party time slot, we will apply your deposit towards a new date. • 0-5 days prior to your party – You are responsible for 100% of the party price. You will lose your deposit. A new deposit will be required to hold your new date. If we are able to rebook your party time slot, we will apply your deposit towards a new date. • Remember deposits are non-refundable (no exceptions). For your convenience we accept cash, Visa, MasterCard, Discover and Amex. Sorry, no checks!! You may invite up to 30 guests if you are having a private party, 15 guests for an open jump party. What if I have more than the number of guests for my party? Additional guests are welcome for parties. There is a $8 charge per additional guest over the number included in your party package. Is there an additional charge for siblings, parents, and/or caregivers? There is no additional charge for parents or care-givers. Other children would need to pay the $8 charge if the amount exceeds the party total. We ask that you and your guests arrive no more than 10 minutes prior to your scheduled party. Please try not to arrive earlier than 10 minutes prior to the party time, as there will likely be another group in the party room. If we are able to accommodate it, and you need to arrive early to setup, there will be a charge of $25 for every 15 minutes. This MUST be arranged ahead of time. The party host is required to stay at the party. Other adults are also welcome to stay and enjoy the fun, or they can leave their emergency contact info with the party host/hostess and come back at the end of the party. For insurance purposes, all guests must have a waiver completed and signed by a parent/guardian. For your convenience, family members aged 17 years or younger may be included on the same waiver. For guest safety and enjoyment, socks are required to play on the inflatables. Socks can be purchased at the front desk should you forget them. Will Bella’s Bouncies provide supervision in the play area (s)? No, parents are required to supervise their own children. Can I spend more than the designated play time in the inflatable area? Yes you can, but it depends on which time slot you reserve. Generally during the week we have more flexibility than on the weekends. Contact us to discuss extending your party times. There is an additional $50 charge for each additional 30 minutes you would like. Do we have to move from one room to the other during the two hour party? No, we give you two full hours in both the jump room and the party/cake room. You can go back and forth as often as you like. When should I order pizza, beverages, goodie bags, & other options? We ask that you order pizza, cake, goodie bags, ice cream, etc. at least three days prior to the start of your party. We can typically accommodate requests within three days of your event, but not always. Also, because grown-ups love pizza and cake too, we have pizzas and cake available just for them. Can I bring my own food, drinks, cake, etc. to my party? We only allow outside food and beverages at our Lake Villa location. You can bring any food item you like, or we can order them for you. The choice is up to you. Each party room has a refrigerator, freezer and microwave. Alcohol is not permitted at Bella's Bouncies. Can I bring my own goodie bags? You are welcome to bring your own, or you can purchase ours for $3 each. If you will be bringing a cake, please bring a serving knife, plates, candles, and a lighter (no matches please). For your convenience, we also have candles and socks available for purchase.